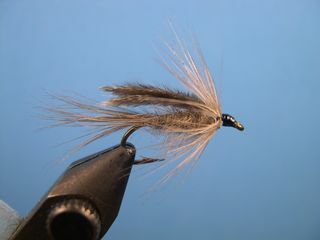 The Gimp, originated by Lacey Gee, the founder of Wapsi Fly, Inc. is a great bluegill, crappie, and trout fly. If you want the full story of Lacey Gee and his "Gimp" nymph click on the "Featured Tiers" page on the navagation bar and scroll down until you find the info. Lacey Gee used gray wool for the body. You can also use any suitable dubbing. I prefer Natural Gray Squirrel fur. It gives the body a fuller and spiker appearance. Peacock Herl also makes a great body. You also might want to use a few turns of lead wire under the dubbed body the help sink the fly. The "Gimp" feathers for the wing come from the base of an Amherst Tippet found on the feather from an Amherst Pheasant neck. The necks sell for about ten dollars and is loaded with feathers that have this aftershaft feather at the base of the tippet. The photo on the left shows the "Gimp" feather at the base of a tippet. Wrap a substantial thread base on the hook shank. 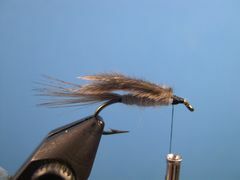 Tie on a bunch of Dun hen hackle fibers for the tail. The tail should equal the length of the hook. Tie on a piece of wool yarn at the base of the tail. Wrap the yarn up the hook to form a tapered body. The body should end about one-eighth inch from the hook eye. Tie off and cut the excess yarn. Tie on two aftershaft feathers for the wing. Place one feather on top of the other, with the tips extending to the middle of the tail. 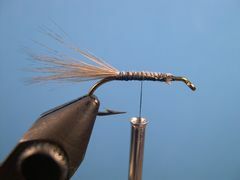 Tie on a dun hackle. 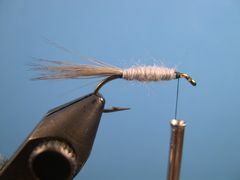 Wrap the feather to form a sparce wet-fly hackle collar. 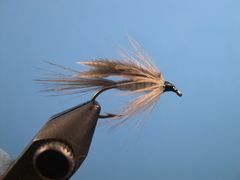 Tie off and clip the surplus hackle. Wrap a neat head and snip the thread. Coat the head with cement. The Gimp in the first four steps is tied the way Lacey Gee tied it. He used wool yarn for the body. I prefer to replace the wool yarn with Gray Squirrel dubbing. Click on this photo to enlarge it and see how much "buggier" the nymph appears with the Squirrle dubbing replacing the wool yarn.